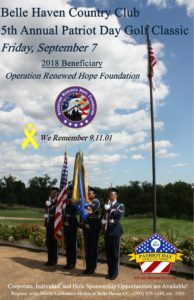 Save the date for the Patriot Day Golf Classic benefiting ORHF on Friday, September 7th, at the Belle Haven Country Club. Check back for more details and to register for this great event. In remembrance of those who lost their lives or those who were personally impacted by the horrific events of September 11, 2001, and in honor of those who protect our freedoms and serve our communities as emergency first responders and servicemen and women of our U.S. Armed Forces, Belle Haven Country Club created this tournament as a fundraiser to benefit local organizations that support wounded warriors and their families, as well as our valued local emergency service providers. This year’s beneficiary is Operation Renewed Hope Foundation. Donations from events like this one make it possible for the charity to get more than 100 Veterans and their family members off the streets and out of shelters and into quality housing each year. Join us in ending Veteran homelessness and remembering those who serve. Your event registration also includes lunch, on-course snacks and beverages, gifts and prizes, recognition program, and light fare dinner and cocktail reception. Click on Patriot Day Golf Classic Brochure 2018 to register your foursome, twosome or yourself.